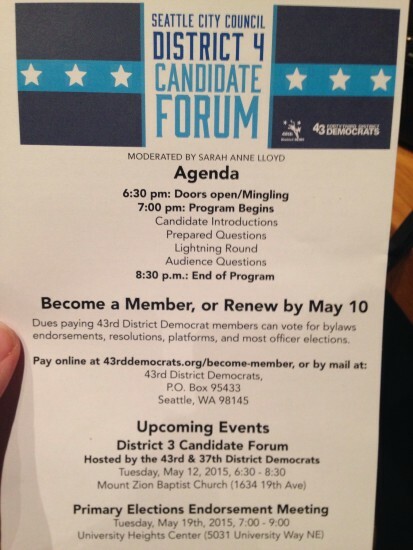 There is at least one more of these District 4 candidate forum thingies, and I will probably attend again. BUT you really should come to one of these events yourselves. Being in the audience makes a difference. And you’ll hear everything that I can’t type fast enough to catch for you here. I wanna say maybe 150-200 people in the audience. Somebody said earlier that they were recording the event and were going to post it on YouTube. I’ll link to it/embed it here when that happens. My thoughts, briefly: Non-incumbents looked much stronger here tonight than they did at the last forum I attended in Hawthorne Hills. Incumbent was looking and sounding a bit…mature. And the lightning round questions that she refused to answer did not go over well with the audience. TJ: Need more and better policing. Transportation choices that work for all residents. Better access with city representatives on a local level. Equal pay a requirement to do business with Seattle. Affordable housing and housing for those who are most vulnerable. Strong voice for district. MM: Wants to represent those who feel like they don’t have a voice. Seattle can be a great city without Olympia’s permission. Strong history of leading on many pro-people issues that can continue. RJ: Hearing common themes from D4 as he walks around: Clean environment, strong schools, good transportation choices, and I align with those themes. City should work collaboratively with schools. Transportation should provide good choices for residents, in all modes. Affordable and family-sized housing also a large concern. JG: Thrilled to be running. Lot more work to be done, thrilled to be doing it. Concerned about Seattle’s gender pay gap – women making 73 cents for every dollar men make. Parental leave will also help women. Recruiting more women at the city level. Talking with Boston about how that city closed their gender pay gap. Q: Nationwide push for gender-neutral bathrooms. Seattle take same approach, and what more can our city do for transgendered people? TP: We should work to make our citizens comfortable wherever they are. RJ: Gender-neutral bathrooms a place to start. Look at hate crimes in the city. MOre community-focused dialogue and to show our inclusiveness. MM: Should more forward with these easy fixes like these bathrooms. But this needs to expand. (Said more here about parity, but I am not familiar with this topic.) Mentioned some work by McGinn here. JG: Bathrooms, yes. Work under “previous mayor” also mentioned. JG: Will listen to voices of various neighborhoods. Same as now. RJ: Laurelhurst: More shuttle bus service to get you to the light rail. For Eastlake, more frequent bus service, and more east-west as light rail opens. Like bike lanes AND greenways. Safe place for everyone. TP: Many n’hoods share concerns, like policing. Schools are overcrowded in NE. Strong supporter of green ways. Connected network bike lanes YES, but not a good fit for all locations. MM: Current bike infrastructure not great, but is getting better, and will increase mobility through the city. Neighborhoods share so many values. Q: Doesn’t want to work for Amazon to be able to afford to live here. Worried about displacement. TP: Would take measure to retain affordable house stock still around, and build more. Rent stabilization. JG: 50K units needed. 20K need to be supplied by the city. Mayor has a group working on solutions. MM: More family-sized units. Displaced folks need housing BEFORE they are displaced. Income tax. RJ: I’m tall and run into stuff. Work also needed on sidewalks to make them more navigable for all. paper boxes and signs also an impediment and need to work with businesses to move those. MM: Funding increases needed for biz and neighborhood outreach. JG: Improvements needed, but not to get rid of newspaper boxes. Perhaps integrate into buildings better. Sidewalk improvements needed in NE especially. TP: Yes, improvements needed. Happy to see money in Move Seattle levy for more sidewalks. Proposals come to the NEDC every year for more sidewalks. Little bit of money from Matching Fund program is never enough. Q: More support from city for schools? Support for Mayor appointing School Board members? TP: Nope. Need to be accountable to residents. More preschool investment. More funds for education experiments that are working. MM: No. School members accountable to voters. City has enough issues to focus on. Expand one year of college program across city. RJ: All three kids will attend public schools. No parents of public school kids on Council, so that voice is missing. Pre-K funding needs to happen. Growth goals need to be paired better with those of the school district. JG: Worked hard to put Pre-K program on the ballot. More free community college for more schools. Family ed levy needs to be expanded. Q: How to enforce minimum wage hike? JG: New office with seven folks hired to oversee this and paid leave, and enforce. MM: Funding for labor laws very important. Council members need to make sure oversight happening, as well as education for small businesses. TP: Enforcement action needs to step up. Equal pay for women should be mandated. Anyone doing business with Seattle should also be following these laws. RJ: Start with education, then more to enforcement. Hold businesses accountable by getting closer to those businesses. More direct pipeline to employees about issue. Move beyond sick leave to scheduling: Childcare hard to manage if work dates not known. Did you vote for district elections? If not, why are you here? Rj: Did not think the funders of the model aligned with his values (thought they were more conservative). Then decided to run and prove himself/those funders wrong. JG: Did not support district elections. At-large members more concerned about city as a whole, not just their district. TP: Strong proponent of district elections. Not look out for city as a whole? Offended by this idea. MM: Has faith in city leaders under either model. Believes in one Seattle. Diversity has increased in those running. Very good thing. Municipal broadband in Seattle? all YES. Use borrowing capacity to build more affordable housing? all YES. For linkage fee before current Council? MM not sure, JG yes, RJ and TP no. Ease regulations on backyard cottages and MIL apartments? all YES. Fossil fuel divestment? all YES. Support park in sisleyville? RJ and MM no, JG and TP yes. Support smoking ban in Seattle Parks? TP and MM no, JG and RJ yes. Support Initiative 122 (honest election Seattle)? JG not answering, all others saying NO. Support rent control? Nothing again from JG, all others yes. Q: Promising strategies for preserving affordable housing? JG: Many more affortable units needed city-wide. Plus for NE Seattle: Solid Ground at Magnuson will be doubling their affordable units soon. MM: Renter myself. Inclusionary zoning to make a minimum of affordable units. RJ: Demographic changes increasing faster now than last three decades. Work with existing landlords on rent stabilization. More upzoning around light rail neighborhoods. Working with developers to get more family-sized units. Q: How is SPD Chief O’Toole and the rest of the department doing? RJ: Public safety a big issue in the NE. Many break-ins on my street last few weeks. Support for social safety net is crucial. SPD doing well with reforms. Need a city-wide conversation about policing issues, though. MM: Enthused about police guild working to change culture. Wants to go out on beats to support officers and their needs. TP: SPD is undergoing positive transformation, encouraged about improvements. But department needs to be fully staffed. Number one priority for campaign. Only one precinct for all of North Seattle? Essential to establish a city-run police academy. JG: (Almost got skipped!) Chief doing a good job and likes new command staff. Force is spread thin. We lose about 50 to retirement each year. Q: What street and/or transportation projects in District 4 get you excited? TP: Excited that city is investing more in transit, and more support for Sound Transit is needed. Hearing from neighbors that east-west service is poor. Large backlog in maintenance projects that needs to be worked on. MM: Seattle Subway folks taking about a spur to Ballard (some applause). Finding solutions for east-west connectivity. RJ: In day job, worked on Sound Transit 2 which brought light rail to NE Seattle. Light rail will release bus hours to increase those east-west connections. JG: Excited about the Mayor’s Move Seattle levy, opening UW Station opening next year and Northgate Link later. Bike trails need maintenance attention. Q: U-District upzone and business improvement district issues. How to deal with those? MM: CM Licata’s amendment was very reasonable (but did fail). BIA funding should be equitable. JG: Supported the BIA. Changes will make a cleaner, safer U-District. People came up during walk in neighborhood and said they need these changes. UW has finally stepped up. RJ: Fan of the BIA. Worried about the suburbanization of poverty. Not a sustainable model for the city we want to become. Density and affordable housing should be in the U-District. Q: Which committee would you like to chair? RJ: Transportation. Speaking specifically about the Move Seattle levy coming up. Infrastructure for all vehicles and modes. Points out the UW Station bus connection could have been designed better. TP: Planning and Land Use. Affordable housing crisis in this city. Incentives to developers are not working. Units in new building should be set aside as affordable housing (or linkage fees). MM: Parks Committee. Done a lot of work there already. Prop 1 campaign made promise to voters about how funds would be spent, would like to oversee that. TP: Honor to be here. Lifelong democrat. Raised by working parents. “Only proven neighborhood leader running for this seat.” Smarter transportation, and affordability. (Mic rather loud on Tony.) Applause after. MM: Running because people need a champion to help make Seattle affordable, and make human investment a priority (beyond just raising the minimum wages). Recently worked to get funding for community centers. Revenue reform important, too. Why am I running again? Why wouldn’t you want to keep a job where you’re making people’s lives better? Helped pass paid parental leave. Prevent shut-offs of water for households with children. Fixed some Burke-Gilman Trail potholes with Cliff Mass along. Wrote about issues as a reporter, now been doing things to help make change. SAL introducing the candidates’ bios that they have supplied. I’ve added a picture of tonight’s agenda to the post, and if you refresh this page it should pop up for you. Alrighty! In the auditorium, warming up the typing fingers. I recall the answers on supporting initiative 122 (honest elections) were all Yes (except Godden not replying. Would hate to see the wrong info reported on that. lb. Squat, 345 lb. Bench, 565 lb. Dead Lift) and a six- amateur kickboxer.